So very close to being caught up on all our amazing hikes in the Presi's over the last month! Missed a couple well-loved hikes but, like the one below, it was covered once before at least! This one is for our Independence Day Loop because what better way is there to celebrate?! Last weekend was a good example of how challenging it can be to match the sometimes opposing needs of dogs with different energy levels and interests. 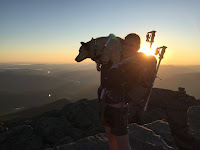 I opted for a sunrise hike up Edmands and over to Lakes of the Clouds and back - easy to moderate trails for Tango and no summits, early morning for Tango to beat the rising summer temps (and because I love sunrise above treeline! ), alpine time for Ty (so she could be off leash that early in the morning), and reasonable mileage for both. Despite finishing a knarly 17 mile traverse the day before, Hannah joined us with her two pups in the wee hours of the morning. I oogled the sky while we dressed the pups in the parking lot. Edmands began easily, a good way to start a morning at 2:00AM! With the headlamps, it wasn't hard to see the couple of small water crossings with log bridges across them. After the last one, we slowly began to gain elevation without adding much complexity to the terrain. As we progressed, the steepness increased but never for too long and the rocks were damp. Edmands is eternally damp at best. As the first hint of orange-red sunlight lined a distant mountain-side, the footing was becoming rockier but we maintained a steady pace. We crossed a brook, which I treated with a little extra thought since it was still dark. From there, the water ran through the rocks of the trail, making me briefly wish I hadn't worn my trail runners (I'd left my boots in the rain a couple days before). It was a nice benchmark letting us know we were getting close. The trail also became less steep shortly after the crossing and was a mix of large rocks to maneuver and mud/flat dirt ground until reaching treeline. The previously non-existent wind made a powerful entrance and by the time we reached the infamous yellow warning sign, I was second guessing my plan of walking into it for the next couple of miles. Breaking out of the trees. against the softening blue sky is a treat for the eyes. The trail didn't seem to vary much in elevation but nonetheless went up and over big rocks that add some difficulty to an otherwise mellow (and muddy) trail. Turning around frequently offered gorgeous views of the sun rising. She really belongs up here! I'm going to be completely honest, I have written about the stretch of Crawford between Ike and Pierce a handful of times so will only describe it in photos here. Overall, it's a lovely, gentle descent then quick ascent of the ridge between the two peaks traversing slabs, mud, and rocky ledges, and beautiful views. We rounded the corner to the junction sign a little bit sooner than I anticipated and we decided to run up to the summit for Titus's NH4K #2! Heading down has been described more than once by this particular blogger so I won't go into too much detail. Crawford is fairly rocky (the round, small boulder-y kind) but still has decent footing and maintains a fairly moderate grade. It has a tendency to be damp, especially in certain areas like the upper section above the Mizpah Cutoff. We noticed a handful of new, several step sets of steps that looked impressive (read: difficult to install) in heavily eroded areas. After Gibbs Falls, we took the Connector down to the road and hoofed it up to the cars. Other than the fact it was warm, it was an enjoyable break from miles of careful footing. We were unsure how busy the road would be around 10:00AM but it was surprisingly quiet with only a few vehicles passing us. There were even a handful of small streams that provided easy water sources for the dogs. I can't help but feel a little guilty for subjecting everyone to reading another Pierce/Ike blog but it's such a favorite for all the reasons I always list: decent water sources, decent footing, and good grades. And, as we've been fortunate enough to say a lot lately, excellent company! The trip report catch-up continues!! **Disclaimer: I want to be upfront; this is NOT advised as a hike for most dogs. It's a big undertaking, physically and mentally. Thanks to Kimberly D. for the pic! Okay, that out of the way... Ty and I did a Presi Traverse!!! As I think I mentioned in my Washington post, we ran into our friend Kimberly on the way down the Crawford Path and she mentioned she was planning a traverse in a couple of weeks and she graciously allowed Ty and I to join. I've become quite addicted to sunrise colors & talus fields and this hike is a powerful enabler, especially under the incredible conditions we were granted by the weather gods! The pre-hike story is rather long but suffice to say we had an absolutely terrifying deer chase in the middle of the night as I was loading her and a couple last things in the car to head out. We were both bloody but a record (in a good way) 15 minutes after she first took off, I had her back so we went out anyways. After driving way too fast, we were only a few minutes late meeting Kimberly for the car spot at the parking lot on Clinton Rd for the connector. Soon after (including one stinky drive with a mysteriously rank dog), we were at the Appalachia trailhead, where we met up with Ann, who joined us for the first two summits. I'll keep the written summary short, as most of the story is in the pictures (of which there are many) and it's more for memory's sake. Advanced apologies it's not as organized as usual. We hit the trail (Valley Way) at 2:30 AM and Kimberly and Ann set a fast pace! I don't know if it was the speed or poor memory, but going up Valley Way was nowhere near as difficult as I'd anticipated. Not that any part was particularly challenging but I remember coming down it a couple of years ago thinking I wouldn't want to go up. Every once in awhile, we could see the sky on fire with vibrant reds and oranges in the pre-dawn light. As that light took over the sky, we passed the hut and began our climb over the talus to Madison's summit. Let me just say: it was glorious. So very special. Boulder fields are not particularly difficult, it's just a matter of picking one's way. We had the summit to ourselves around 5:15 AM and took in the views as much as we could before heading down. We took a break at the hut, where we saw a large jackrabbit (I leashed Ty for a bit!) then headed up Gulfside. I absolutely loved this stretch of trail. It was a combination of stone dust-like gravel, talus, and winding between low rocks and grass until reaching Thunderstorm Junction. Then came another stretch of picking one's way over talus on Lowe's Path to reach Adams' summit. Again, not terribly steep, just a matter of picking one's way. Despite passing a group of fellow traverses and a couple miscellaneous hikers, we had another summit to ourselves and enjoyed the effect the still-rising sun had on our photos. Back down at Thunderstorm Junction (giant cairn), we bid farewell to Ann, who was headed home for a nap before a Franconia ridge traverse! Between Adams and Jefferson was longer than I recalled but often very enjoyable. It was a bit steep after passing through the col and heading up Jefferson and Ty actually needed to evaluate one particular set of rocks. It was a relief when the ground leveled and the rocky summit came into view. We tried to linger and Ty even laid down while we had our first real food since beginning but Kimberly saw a mondo bee of some kind and we made haste departing. Super official summit marker, no? More picking our way over rocks... then Monticello Lawn! Pictures and (morbidly, I admit) stories from Not Without Peril had created high expectations that were promptly met. It is quite surreal and tranquil to walk over a somewhat-easier-than-the-last-few-miles path through a field that seems like any other except it sprawls out at over 5,400 feet in elevation. If only she'd look at me like that! Mt Clay up ahead. We skipped it but it'll be a nice peak to visit some other day! Eventually we reached a spring that Ty plowed right through (oye) and the junction where we opted to go around (vs. over) Mt Clay. Around that point we met the first other dog of the day, a gorgeous black and tan GSD with her two young, fast-paced companions and I wondered if they were also doing a traverse. If Ty hadn't had her 15 minute sprint before the hike, I think she would have abandoned us for them! It was also at this point we started encountering more hikers. That trend continued as we proceeded closer and closer to Washington. 100% above treeline, there isn't too much to describe that can't be understood through pictures. The rockpile portion of "the rockpile"
Other than running in to buy hot dogs for Ty (cash only, FYI!) and looking for Kimberly's friend who was participating in the road race, we didn't linger due to Ty's extreme stress. This dog.... Onto the Crawford path we hopped on our way to the hut and last three summits. In design and terrain, the Crawford Path is among my absolute favorites. It's also a zoo and we were constantly moving over for those heading up. Generally, the trail is smooth but easy-to-descend rock with stretches of sand-like gravel/dust here and there. At the Lakes of the Clouds hut, I ushered Ty to the only patch of shade and she immediately collapsed into a sleep so deep, she hardly noticed a gorgeous pittie giving her a sniff down (I didn't notice him at first either!) but the hut staff did immediately when he snuck in. she initially felt about her boots! Ty awoke to Ruffwear Summit Trex on her feet (courtesy of Backcountry K-9) as part of their Brand Ambassador team, as very tiny portions of the sides of a couple toes and dewclaw were a bit red. (Prior to the hut, I had been applying a protective cream regularly). She struggled up Monroe (due to the boots) but was a pro by the time we followed Kimberly onto a side path to skip Mt Franklin, as she had to boulder-hop the way down the loop. From the shortcut, we followed the Crawford Path towards Eisenhower and I could feel the end was nearing... sort of! The stretch between Monroe and Eisenhower was something I'd yearned to do for awhile and that special-ness carried me mentally for the next couple miles while Kimberly was subjected to the sounds of a clumsily galloping horse tailgating her (Ty in boots!). Ty bonked as the hump up to Ike's summit began. Finally, I pulled out my remaining PB&J sandwich to coax her. Miscellaneous warning: Xylitol, the sweetener, is now common in many pantry products. Check labels more than ever before sharing with your pups! We passed by the summit sans celebration due to the moderate crowd and reactive Weim but Ty was okay without more of a break for another mile or so. Between Ike and Pierce is usually a favorite meander and I had to keep reminding myself of that, as my mental energy was waning along with Ty's physical stamina. The more we stopped for her, the more I was ready to reach the next junction. Kimberly was definitely stronger and more patient than me! The views were still fantastic but the temps started to rise as we lost elevation. We finally made it to the Webster-Jackson junction and I dropped my pack and coaxed Ty to jog up to Pierce's summit cairn with me to make the traverse official. Anyhoo.... that was our Presi Traverse! Paw-friendly? No. Dog-friendly? Not particularly. Spectacular? Yes. There are definitely more strenuous and steeper/more technical hikes in the Whites and beyond but 19.8 miles over 7 summits (or more for those who do the unofficial peaks), mostly above treeline and often over rough talus is not something one shouldn't consider lightly for their pup (or themselves!). I'm proud to say my almost 8 year old did it and did it well but we will probably split it up into smaller loops and traverses from now on for the sake of enjoyment. We started strong and ended with lots of breaks dictated by Ty for the last few miles, that I'm grateful Kimberly was patient about, totaling 15.5 hours - a very long and memorable day! naked patty after this big day!